I have to admit something. I have loved being a part of Daring Bakers so far, but I was feeling a little burnt out after last month. I was feeling lazy. And uninspired. Mostly lazy. So I dragged my feet when it came to finishing this month's challenge, and even though what I came up with was neither spectacular and kind of ugly, I couldn't bring myself to give it another go. The 40 degree weather didn't help things. And November was a busy, busy month for me, with my birthday and many others to celebrate. But I still wanted to participate this month, because I've never made cannoli before, and I was ready to conquer my fear of the deep fryer. 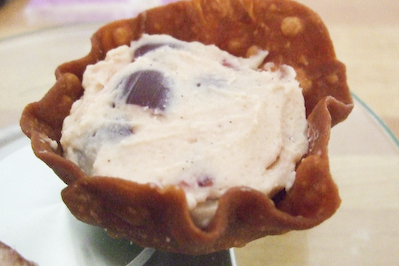 If I were to do this challenge again, there's no way I would have made these darned cannoli cups. There were a pain in the bum to get into a nice shape, and the whole time I was making these I kept thinking they looked really, really ugly. But it wasn't all bad, they tasted SO amazingly good, and I got to use some of the fabulous birthday presents I got, including Leona and Lisa's kitchen appliances, Betty's amazingly gorgeous tea cake stand and the blowtorch that A got me (he knows me far too well). (Don't worry Karen, I'll be using your present very soon!) 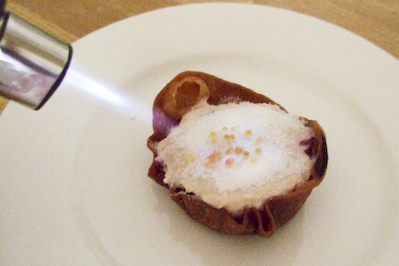 It was very exciting to use the blowtorch for the first time, the whole idea for these was inspired by the amazing brulee tarts that they sell at Bourke St Bakery. 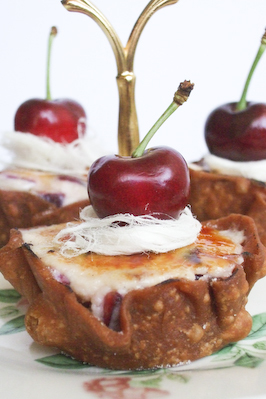 That crunchy toffeed top cracks nicely and gives way to a creamy ricotta, vanilla and fresh cherry filling. It's the start of cherry season in Australia, one of my favourite fruits. It always reminds me of Christmas, a very Aussie Christmas. Luck was on my side it seems, I walked into my local grocers to be greeted with the sad sight of a half empty tray of dead looking cherries. I was staring at it despondently when one of the guys working there goes to me "if you wait here for a minute, I'll go get you a fresh new batch!". How nice is that?! So before he even put it on the shelf, he opened up a huge bag of delicious cherries and let me have first pick. I decided to get more than I needed so I could eat plenty of them as I was baking (err, deep frying I mean). Things did not go quite so smoothly after that. 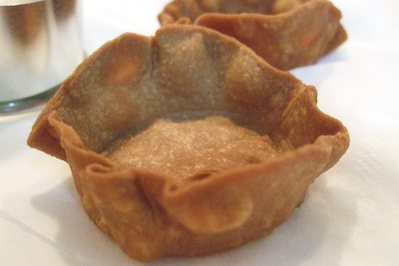 I had trouble figuring out how I would make my cannoli cups. Like big ugly warts rather than nicely shaped cups. In hindsight I should have attempted baking them instead of deep frying, but I really wanted those distinctive blisters on the side of my cups. I decided to use some steel cookie cutters to use as moulds, which I wrapped circles of the dough around. It was tough to get this to work. The dough kept expanding and falling off the moulds, meaning that it just turned into a flat, ugly thing as soon as it hit the oil. 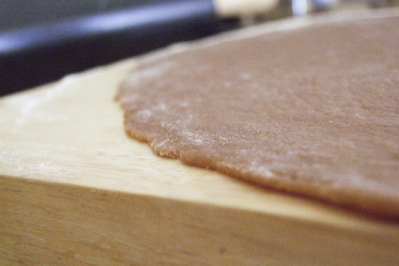 Also I wasn't rolling my dough thin enough, so it wasn't blistering and was going soggy. When I finally got the thickness right, I also read the hints properly (told you I was feeling lazy this month) and remembered to dock the bottom of my cups to stop them from ballooning up in the oil. I still had to do the cups one at a time which was a pain, but at least they were in some sort of shape that could hold a filling. The filling was simple, but delicious. I upped the amount of vanilla, and made sure there were lots of cherries throughout. It was hard to torch the tops of the cups without burning the edges of the cannoli, so unfortunately they got even uglier. But we ate them quickly, before the cups got soggy and they tasted brilliant. 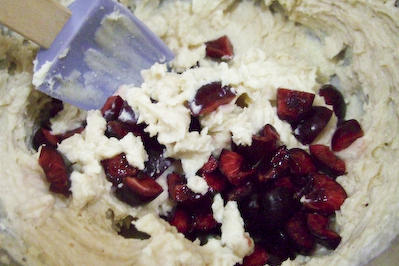 The cherry, vanilla and ricotta combination is a winner and I would love to use it in a tart. The caramelised, crunchy tops were heaven, I will have to restrain from torching every single thing I bake from now on haha! I have adjusted the recipe to how show how I made my silly cups, but if you want the original method, check Lisa Michele's blog for her DB post. 3. Oil the outside of the moulds you will use for your cups (I used my stainless steel cookie cutters) (You only have to do this once). 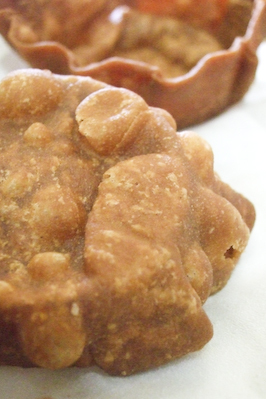 I used my hand to gentlywrap a dough circle around the bottom of the cookie cutter. 4. In a deep heavy saucepan, pour enough oil to reach a depth of 3 inches, or if using an electric deep-fryer, follow the manufacturer's directions. Heat the oil to 350-375°F (190 °C) on a deep fry thermometer, or until a small piece of the dough or bread cube placed in the oil sizzles and browns in 1 minute. Have ready a tray or sheet pan lined with paper towels or paper bags. I had a lot of trouble maintaining my oil around the 360°F mark since I have stupid electric coils, so my cups browned very quickly. 5. Carefully lower a cannoli cup into the hot oil. Fry the shell until golden, about 2 minutes, turning them so that they brown evenly. 6. 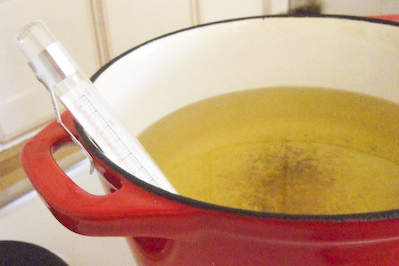 Lift a cannoli cup with a wire skimmer or large slotted spoon, out of the oil. Using tongs, grasp the cannoli cup upside down to drain any oil. 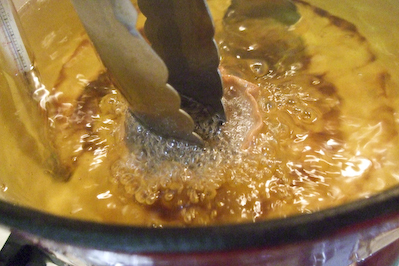 Very carefully remove the cup with the open sides straight down so that the oil flows back into the pan. Place the cup on paper towels or bags to drain. Repeat with the remaining cups. While they are still hot, grasp the tubes with a potholder and pull the cannoli shells off the tubes with a pair of tongs, or with your hand protected by an oven mitt or towel. Let the shells cool completely on the paper towels. Place shells on cooling rack until ready to fill. 7. Repeat making and frying the shells with the remaining dough. 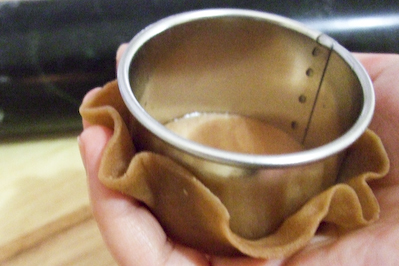 If you are reusing the cannoli cup mould, let them cool before wrapping them in the dough. 8. Line a strainer with cheesecloth. Place the ricotta in the strainer over a bowl, and cover with plastic wrap and a towel. Weight it down with a heavy can, and let the ricotta drain in the refrigerator for several hours to overnight. 9. 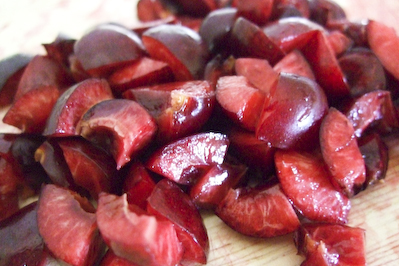 Remove cherry stems and pits, and chop up into small pieces. 10. In a bowl with electric mixer, beat ricotta until smooth and creamy. Beat in confectioner’s sugar, cinnamon, vanilla and blend until smooth. Fold in the cherries gently. 11. When ready to serve, either pipe or use a small teaspoon to fill your cannoli cups. Smooth the top of the filling with the back of a spoon or a spatula. 12. Sprinkle a generous layer of caster sugar over the top of the filling. Use a blowtorch to caramelise the sugar, creating a crunchy toffee top for each. Try to avoid burning the edges of the cannoli cups. Optional: Top with vanilla fairy floss and a fresh cherry. I don't know what you were going on about before cos these look fab! 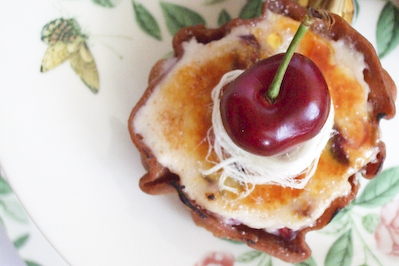 The sound of cherry brulee sounds heavenly. Great idea to use cherries and I love the cup idea - I agree with karen - I think they look great! Well done on the challenge! They may have been a pain to make, but they turne dout just gorgeous!! Love your high tea platter. Steph, your cannoli cups are awesome! 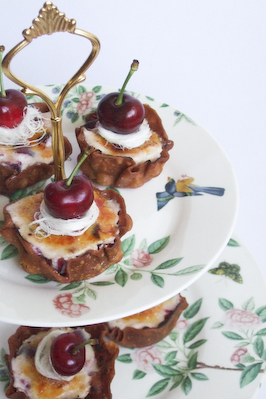 Love every component of it... the festive touch with the cherries, the clever use of your brand new blowtorch, the pashmak, the cute cannoli cups...... I can go on and on... oh and the beautiful cake stand! These look like they would have been quite tasty. Pity the cups didn't work out to your liking. WOW I think you are too harsh on yourself your lovely cherry brulee cannoli are perfect and your step-by-step photos are so clear and precise that anybody can understand the process. I adore cherry so these are on my list of Christmas. Cheers from Audax in Australia. I think they're very cute! 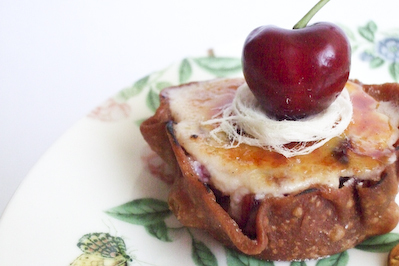 and cherry brulee - fantastic choice of filling!!! These are not ugly! I look at them and just want to dive into them and start eating! well done! Cherry brulée... just the sound of that is making me drool. 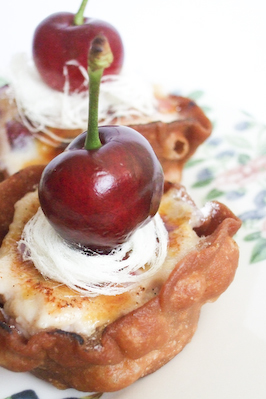 I love cherries and brulées, I am so trying this one out! Wonderful job and very nice pictures! Very creative, they look so pretty! Aw I don't think they look ugly! They look cute! And omg they sound so tasty. I don't think these cups look lazy or uninspired at all! I think they look fabulous and your filling is making me crave Cherry Garcia! Very cute! The perfect afternoon tea bite :) Seems like everyone else (including me) totally picked the wrong day/weather to do this challenge! Ahh looks very cute, like a cannoli cup cake! and I can't believe that you were deep-frying the cannoli on that scorching hot day. Oh my goodness! These are stunning, and look oh so delicious! Some of the most creative I've seen so far - Wow! It may not have been a perfect cannoli but I'm sure they were absolute delicious. What you did is really original. I would have preferred yours. More filling.. These look amazing! I don't think they looked ugly at all...at any stage! i find that blow torch pic fascinating oh baby burrrrrrn! Wow, what a perfect recipe! I would eat a few of them for dinner, the filling sounds heavenly! Great idea with the tart cannoli. Oh My Word! You are so cool! I want to eat these all up! "That crunchy toffeed top cracks nicely and gives way to a creamy ricotta, vanilla and fresh cherry filling" - best drool inducing sentence EVER! That fairy floss is also so, so....amazing! Yay you christened your blow torche! I LOVE UR DB challenge because its unique and creative and thinking out side the box which makes it stand out the most. It doesnt look ugly one bit its really cute especially with AB's tea cake standdd <3. I love how you created little cups - even if you thought they were ugly, they are such a great idea! Karen - Aw thanks hun! :) Even so, I will use it soon! Betty - Hehe thanks! I know, the fruit shop man made my day :) Your stand is so awesome, I'm in love with it! Ellie - Aww shucks Ellie! You're going to give me a big head! Simon - Yeah I think I would have liked them a little less messy, but they were tasty! Jacq - Heehee thanks! Get a blowtorch they are so fun!!!! Karine - Oh thank you!! Anita - Mmm the filling was my favourite bit, I could have eaten it on its own! Jenny - Ooh let me know if you do try it, I'd love to know how it turns out for you! pigpigscorner - Thanks so much! syrupandhoney - Hehe they were quite tasty :) They disappeared fast! Megan - Ooh I've never tried that before, hopefully will get to try it soon! Y - Seriously, the weather the entire month was wrong for the challenge! Lisa Michelle - Aww thank you so much!! It was a really great challenge to pick, I would have never got the chance to try it otherwise I think! A cupcake or two- haha that's right, more filling = yum! chocolatesuze - hahaha yes it was so fun using it for the first time! Chocolaty Lifestyle - mmm cannoli for dinner, sounds like my kind of dinner! 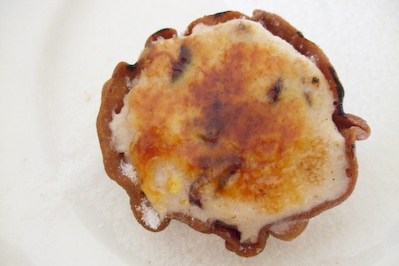 andaoana - thank you :) I was inspired by the brulee tarts I tried at bourke st bakery! Lorraine - Aww thanks! I wish I could have come up with as creative flavours as you did though! Catalina - :D Yay! The fairy floss is my favourite decoration, I have bags of it! Leona - :) *hugs* thank you!!! I got to use your presents too which was great! Julia - Thanks very much! Cherries are such a great Christmas treat, I swear I eat bags of them during the holidays!